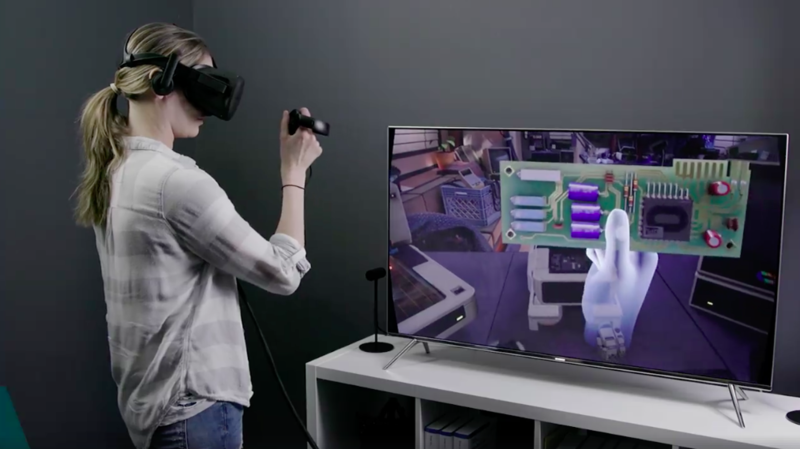 With the Oculus Go out the door, Facebook and Oculus VR are looking to what's next for virtual reality, and at Facebook's F8 conference it revealed a new internal prototype that dramatically improves the quality of the medium. Nicknamed 'Half Dome', the headset increases the field of view from 100 degrees to 140 degrees, letting the wearer see more of the virtual world. Yet more impressive is that the headset also has a variable focus, so you'd be able to focus on objects at different distances, whereas current headsets have a fixed focal plane. Last year we spoke to one of Oculus's scientist working on this problem, who told us that the team had solved this problem with something called a focal surface display that manipulates light to better mimic the way our eyes naturally focus on objects at different distances. However, Maria Fernandez Guajardo, Oculus head of product management, said at F8 that Half Dome achieves different focal points by physically moving the displays inside the headset, so it sounds like this works a little differently. However, she added that the user won't be able to hear the screens moving or feel any vibrations. Even more impressive, Oculus has managed to do all this without bulking up the size of weight of the headset. The result of all this should be fewer blurry objects, making the virtual world sharper and more realistic. You'd be able to lean in and look at objects up close with much better clarity, while the greater field of view will help enhance the immersion. Where will all this end up? Impossible to say for sure. The next big Oculus product will be Santa Cruz, which essentially takes the Rift wireless, but we'd be shocked if any of the Half Dome tech makes its way into that at this stage. Instead, we'd hope to see it in the next iteration of the Rift, whenever that day comes.